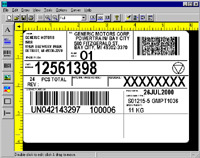 Whether you need to print bar codes, text, graphic images, or from databases, LABELVIEW has the features to help you design and print labels with ease. It supports over 30 bar code symbologies, True Type fonts, and over 500 thermal and laser printers, providing the flexibility to handle all of your labeling applications today and in the future. A simple, yet powerful, Windows interface walks you through object creation. OLE Automation - Allows for third party integration for labeling automation, based on Microsoft COM model for application integration. OLE Client - Creation of objects from other applications such as Microsoft Word and Adobe Acrobat. 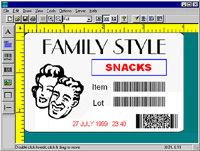 SENTINEL Print Pack Support - Use LABELVIEW software as the label designer for ERP connectivity. Job Modifier - Make small changes to existing driver output without changing drivers, and gain access to True Type fonts on thermal printers. OLE DB - Database connectivity allows you to open database files over the Internet. For more information concerning LABELVIEW Thermal Software, or to place your order, call our Customer Service Department at 1-800-344-4088.